Siying Zhou is an interdisciplinary and project driven artist. Zhou focuses on subjects such as the religious practice and cultural traditions in the life of the nomad, identity of individuals within the culture of globalization, the intricate relationship between the land and its dwellers and the correlation of physical and imaginary spaces. During the period of PICTURE BERLIN 2016 Summer Session, Zhou continued her current research project in which she explored the complexity of cultural identification and the idea of cultural uncertainty in today’s societies that are influenced and formed by development of globalisation. By primarily using photography, video and participative events, Zhou explored her multiple cultural identities: A china-born Australian who was currently visiting Berlin as a tourist, in Berlin and requested the meaning of being German. Zhou raised a question: what was required for a foreigner to be considered as a German in Germany? Zhou implemented a project based on two key questions: “How many German dishes ought I to cook to become a German?” and “How many German jokes ought I to know to be more German?”. In the project, guided by these two questions, Zhou requested a German dish from German participants. The participants decided the amount of detail about the dish that they could tell. Then, the participants were invited respectively to a dinner in which the described German dish was cooked and served. At the dinner, the participants were also requested to tell me a German joke. In the end Zhou had totally cooked six dishes, dined with four Germans and collected four German jokes. The definition of being German was interrogated, shaped, examined and recomposed throughout the project. As the result of this project, Zhou produced an installation work titled If you are not a foreigner, you must be one of us. 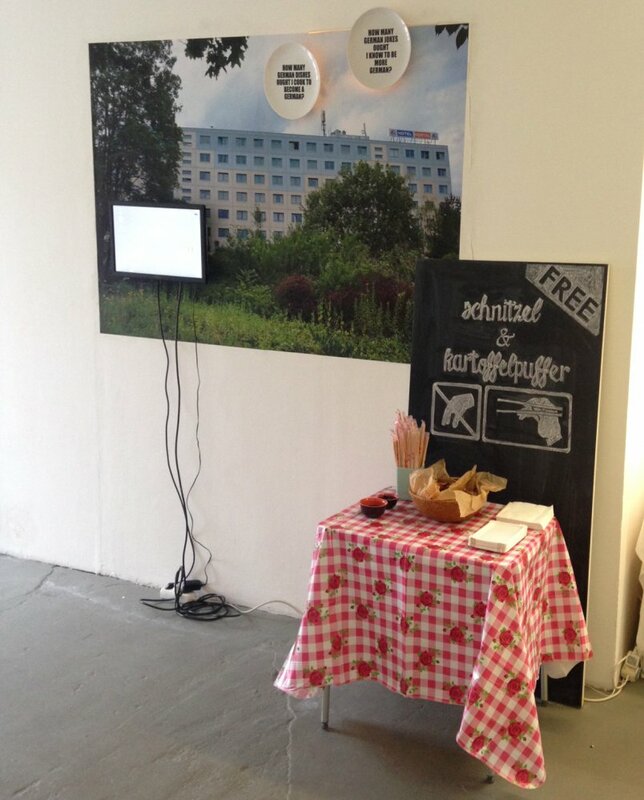 This work was exhibited at the final exhibition of PICTURE BERLIN 2016 Summer Session: Ohrwurm. The installation consists of a video shown on a TV screen, two plates and a paste-up of photograph print. At the opening of the exhibition, a food-serving event took place at the exhibition venue. Zhou offered free Kartoffelpuffer (potato pancakes) and Schnitzel and required the visitors to take the free food with chopsticks.